What are Ikea’s Swedish Meatballs like? 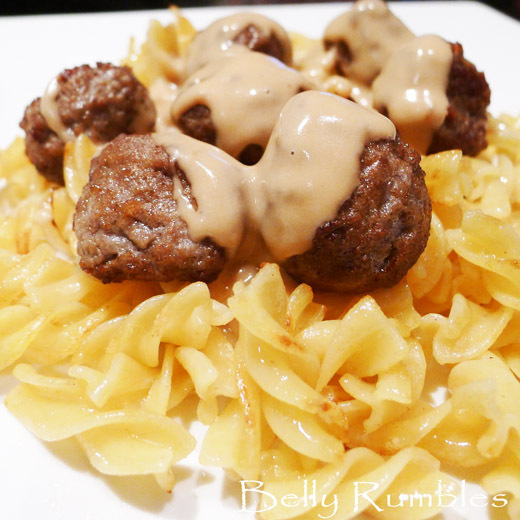 A review of Ikea’s Swedish meatballs, are they worth the hype for a quick and easy meal at home? IKEA Tempe opened with a bang a couple of weeks ago, floods of visitors, free meatballs and traffic jams. I decided to drop in mid afternoon this week with the hope that everyone was back in the office post lunch or picking up the kids from school. My plan was a winner. I avoided successfully the masses of people and parked right near the front door. As much as IKEA wanted to bestow their flat pack love on me, that wasn’t the purpose of my visit. I did everything to stay on track for my task at hand. I did avoid purchasing a single flat pack item, but purchases I did make. I picked up some lovely blue, aqua and green drinking glasses, a couple of packs of much needed coat hangers, and this funky circle creation to hold my scarves in the wardrobe. Again, making note they were all not flat pack items. After checking out Ikea I headed to their food section. Not located in the main shopping area but near the registers and their cafe. The amount of Swedish food items on offer is quite impressive. I ended up purchasing all sorts of bought all sorts of edible goodies. I brought home biscuits, a frozen chocolate torte, mustard, horseradish and frozen cinnamon buns (more than one type). 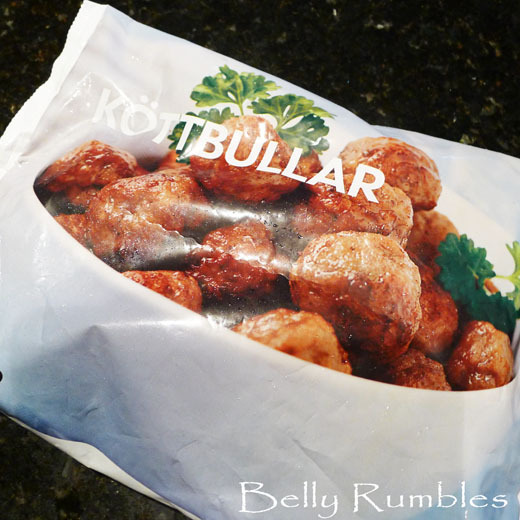 Plus a packet of the much talked about Swedish meatballs. 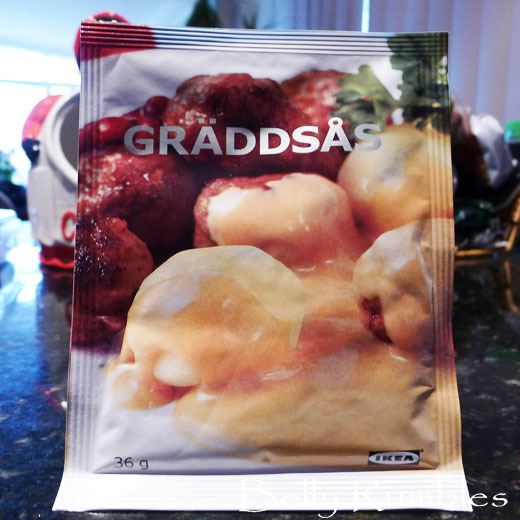 I also picked up a packed of Graddsås, a creamy sauce mix advertised as an accompaniment for Ikea’s Swedish Meatballs. After hearing praises for Ikea’s Swedish Meatballs I now had some of mine to road test. I don’t want to be Ms Negative, but how good can a frozen premade meatball be? Eventually we found out on a night I didn’t feel like cooking. I dragged (sense my enthusiasm) Ikea’s Swedish Meatballs out of the freezer for dinner. Dinner preparation was a very easy task. 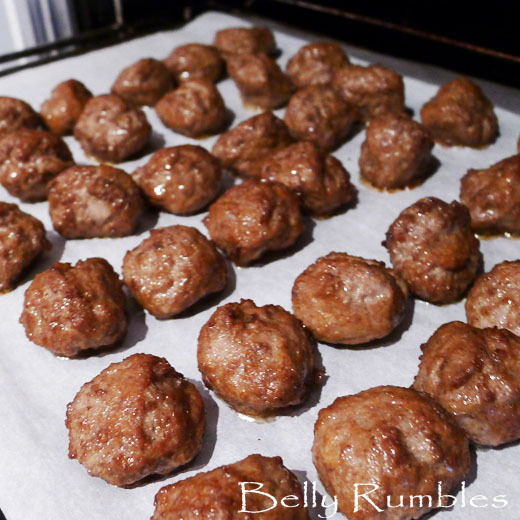 A simple case of placing the meatballs on a tray in the oven to cook. They were ready to serve after baking in the oven at 180 deg C for 20 minutes. I decided to panfry some cooked noodles with onion and butter to have with them. This is probably not the healthiest of dinners, but it was pure comfort food. Exactly what I felt like on this particular evening. The Graddsås sauce was also extremely easy to prepare. All I had to do was boil some water and add some fresh cream. Then the powdered sauce mix was whisked in over head. It thickened very quick and was ready in no time at all. What are Ikea’s Swedish Meatballs Like? Not expecting much at all, I was pleasantly surprised how good they were! The meat of the balls is a very fine texture and the flavour is surprisingly good. They would be perfect heated up for quick and easy finger food. The Graddsås, which I thought would have a chemical unnatural taste didn’t. That surprised me the most as I generally don’t like packet sauces. It was very much like a creamy gravy. I believe adding your own fresh cream to the mix makes all the difference in the success of this sauce. Would I buy them again? Yes, I would! It was a cheap, quick and tasty meal. I would love to know if you have a quick and easy frozen meal hidden in your freezer? One that you whip out when you don’t feel like cooking. Your dish looks so tasty 😀 I think that meatballs is a great choice to have a quick delicious dish. So how long will it last in the refrigerator? They are a frozen item you purchase from Ikea, so quite a while in the freezer. Just check the expiry date. I have made these for a quick and easy tasty dinner for my hubby and myself. Stick them in the oven, prepare sauce and spaghetti noodles and away you go???? We love them. 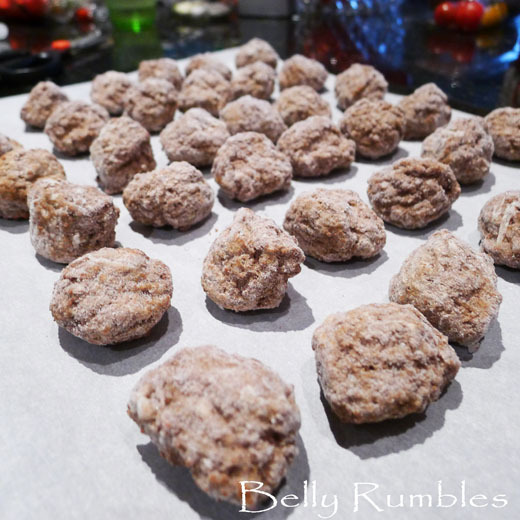 Hi Rosemarie, they are so quick and easy, yes wonderful for those lazy Sundays. The meatballs sound great for a quick and easy meal, especially on lazy Sundays. Hi FoodIsOurReligion, Rhodes is just so far away (for me), so glad the new Tempe store has opened. Hi Rita, I am blessed with a big deep freeze, the ‘box’ style. Hi JasmyneTea, You have never been to IKEA, ever? Wow, go, worth a look, for looking sake. Hi Anna, Thank you, it really is a maze isn’t it! Hi Simon, they weren’t too bad. Hi YaYa, you are so right about the gray. Hi Gaby, they were a nice to use on a “i don’t want to cook” day. Hi Miss Piggy, I am sure they are terrible for you. Hi Vivian, need to get some of that jam, saw it there. Hi Jennifer, didn’t see any fish lollies, hmm, return visit for me. HI Renata, when IKEA first opened in Australia, they didn’t have food. Yummy! Yours looks so much more appetizing and comforting than the Ikea’s. I really do need to make the time to visit IKEA. I’ve never been! The meatballs alone would be worth it. I need to find a time where my freezer isn’t bursting (with contents my mother-in-law drops in there) to buy a bag of these – if only they came in smaller packs! You make me want to go to Ikea now. Next stop, Rhodes. Meatballs are the shizz! I wanna go to ikea now a buy a few bags! Ahhh Ikea, I love all the flat pack furniture, but really I go there for the Swedish fish lollies. Yum!!! I also decided to try their apple cider last time we were there and it was surprisingly good. I’ll pick up some meatballs next time for my fiance, I am sure he will love them. Hubby is MAD for these meatballs – he brought how TWO packs after just one Ikea visit…I like them, but I’m sure they are not very healthy (which is why they taste so good, right)? No Miss Piggy! The meatballs are not unhealthy to eat. Not more than any other well made meat based meal. I totally forgot about the new store opening this month. Wouldn’t mind having some of those meatballs in my freezer for emergency cases, they look very good once reheated. I tried them at Ikea after reading a few bloggers reviews and the first lot were really good but I think I liked the creamy gravy better, it tasted a little like mushroom sauce to me. The frozen ones are great too and make really easy spag and meatballs. I tried a second lot about a year later and it seemed they’d gone down in quality, not tasting quite as good. And I thought consistency was what they were good at! Hi Lorraine, my only experience with Swedish meatballs when I was young was via the Chef on the Muppets, and I thought he was pretty cool. 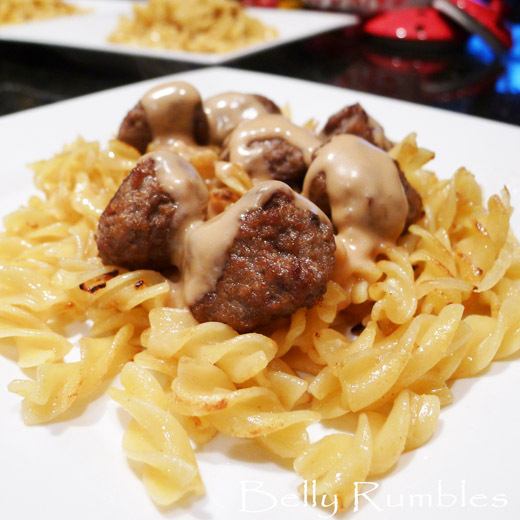 We used to be obsessed with Swedish meatballs when we were young. I think we even found and made a recipe for the creamy sauce too. And yes good idea not going on a weekend!